Retailers may order directly from the publisher, By Light Unseen Media. For terms and shipping information, call 978 / 433-8866, visit http://bylightunseenmedia.com/undeadtv.htm, or contact sales@bylightunseenmedia.com. Your favourite independent bookstore can order Un-Dead TV on request from Ingram, or direct from the publisher. New! An autographed, personalized paperback copy may be ordered directly from the author. Just select the shipping destination, and indicate to whom you'd like the book personalized (if applicable). Then click on the Buy Now button to pay safely and securely through PayPal. Prices are in Canadian dollars, and include shipping via Canada Post. Please note that due to the personalized nature of this purchase, returns will not be accepted. Any questions? Contact the author, Brad Middleton. 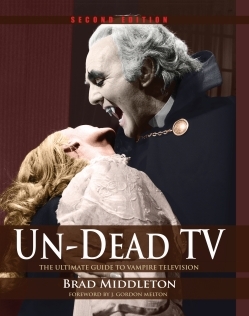 Note: the above images link directly to the paperback edition of Un-Dead TV. The hardcover edition is also available for purchase at each site.